I remember the game that he first tore his hamstring. He did recover from it, but he was never the same player. Didn't he tear it three times? Something mad like that. The only games I want to see him feature in from now until the end of the season are the semi final and, with any luck, the cup final. He should be rested for the rest of the league games, with perhaps the odd exception of coming off the bench here and there to keep a bit of match fitness. If Lennon doesn't rest him for the remainder of the league matches (apart from a few cameos, because as you say, he needs to maintain match fitness in case they make the cup final) then all this "I want to give Tierney three months rest" is another way of saying "I want Scotland not to pick him". He's too young and talented to be another Scott Brown. There's only so much he can do at Celtic and it's not like they have deep CL runs anymore, heck even winning a knock out round in europa is a stretch these days. Smart money would be on him moving to Leicester. His old manager is there and Man. City were looking at Chilwell who's their left back so there could well be a vacancy in the summer to fill for Rodgers. "Getafe have agreed to splash out £1.5million to sign Jack Harper for their potential Champions League campaign next season to avoid having to go to a tribunal with Malaga." So, Harper is good enough for the fourth best team in La Liga, but not Scotland. If Fraser does go to Arsenal in the summer, that would make him the first Scotland player at the Gunners since Charlie "I'm sitting here thinking" Nicholas wouldn't it ? Ryan Fraser must surely have some thinking to do ? He's obsessed with both sitting and thinking. I'd say that Nicholas was the most recent really good player we had at Arsenal, but the most recent one is Scott Marshall. Wenger pretty much scrapped his scouts going to Scotland because of the sheer lack of quality at grassroots level. Charlie Gilmour has played for Arsenal this season and last I heard he was committed to Scotland. That's the thing, though, we don't know whether he's committed to us or England. He's switched more like than that little lad from Celtic... maybe not, but he has switched twice. I expect he is. He's rangers daft...reminds me of what Halliday used to be like on social media. Funny that. My mates dad is their main scout up here and has been for decades. I bet he'll be playing 90 minutes tonight against the football titans St Mirren (apologizes to St Mirren fans for the sarcasm). Hope you never lumped on! Really? Then I would appear that I'm mistaken. I'm sure that I read something like that while back. I get partial credit as he did say this: "They have certainly neglected something in recent years because there is no real talent coming through"
In fairness to me, they usually would. It's nice that they didn't play him, though, hopefully it continues for his sake. I seem to remember Arsenal didn't pursue their interests because they felt that Naismith's potential wasn't as big as it would have to be to become an Arsenal player. They weren't wrong. Excellent point. So next year we're going to have a striker playing in the most technically skilled league in the world at a time when there's a complete dearth of international strikers but Harper's not even getting a mention. FFS we just played a striker who couldn't get a game for Reading. This is Jack's first season in the first team for Malaga, he's scored a few goals and gathered some good reviews from the Malaga faithful. If he'd been playing at some mid-table English Championship side, damn sure McLeish would have called him up by now. Olly McBurnie anyone? Exactly. The inclusion of McNulty over Harper was just a bizarre choice. Harper is holding his own against the second tier of Spanish football, and he's just gotten a move to a top 5 La Liga team. How this doesn't warrant a call up is beyond me. Harper should've been involved in the previous two squads, without doubt. And as for McBurnie, I think he's found himself on the bench for the past few weeks... and yet odds are he'll still be our number one pick. Not calling up Harper and keeping McTominay on the bench... the more I think of it, the more I'm convinced that McLeish has lost his marbles. If Olly McBurnie or Mark McNulty is the answer then fck knows what the question must've been. Surely Ryan Fraser will end up at a top 6 side sooner rather than later. Only behind hazard and erikson for assists in the EPL, he might be ahead after yesterday where he set up another two goals and scored one. Only one assist less than Messi and fifth highest in European top leagues, in fact I think if you add his and Robertson's together Scotland has the best combined assist record in Europe. 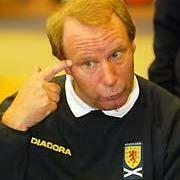 McNulty really was a joke and is typical of the way McLeish panders to Scottish based football. Harper should have been in the squad just to look at least even though he has done next to nothing yet. He has a million mile to travel from not being good enough for Brighton under 23's to champions league, but if 22 games in the Spanish second division makes you international class well hey ho.